The effects of climate change on water are expected to intensify in the Mediterranean and surrounding regions in the coming years. This raises potential threats to the security of populations, particularly those most vulnerable to droughts or floods. There is danger of "water wars" climate change is rapidly becoming a threat to national security. 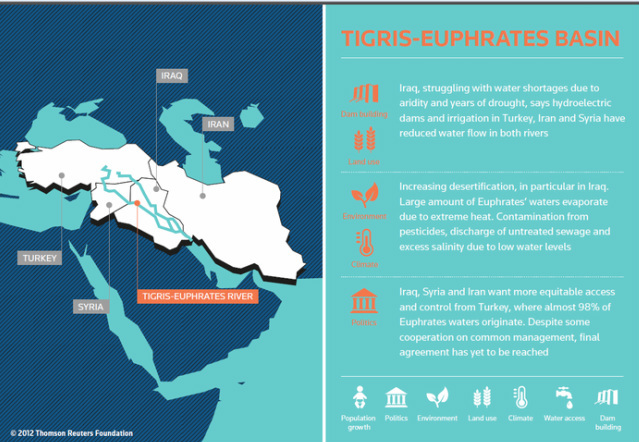 Water security is precarious in conflict or disaster zones, where it is subject to their negative impacts. Disasters and conflicts have an impact on water resources and related ecosystems by reducing their quality, quantity or both. In Sudan, violence broke out in March 2012 at the Jamam refugee camp, where large numbers of people faced serious water scarcity (McNeish, 2012). Disasters and conflicts reduce water security by compromising the physical infrastructure needed to access water, sanitation and hygiene services, such as treatment plants, drainage systems, dams, or irrigation channels. Conflict is most likely to occur over water when disputes involve access to water of adequate quantity and quality. Even when water supplies are not severely limited, allocation of water among different users and uses (urban residents and agriculture, for example) can be highly contested. Degraded water quality, which can pose serious threats to health and aggravate scarcity, is also a source of potentially violent disputes. 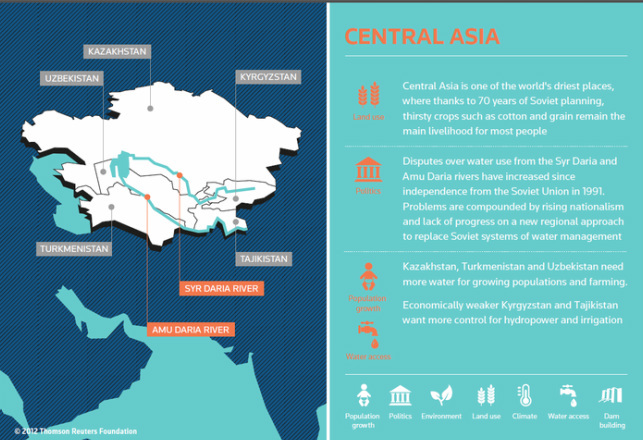 Water’s importance in sustaining human livelihoods can indirectly link it to conflict. Water is a basic resource for agriculture, which is traditionally the largest source of livelihoods. If this livelihood is no longer available, people are often forced to search for job opportunities in the cities or turn to other, sometimes illicit, ways to make a living. Migration—induced by lack of water, sudden droughts and floods, infrastructure construction (e.g., dams), pollution disasters, or livelihood loss—can produce tensions between local and incoming communities, especially when it increases pressure on already scarce resources. And poverty due to livelihood loss has been identified as a frequent cause. In most cases, it is not the lack of water that leads to conflict, but the inadequate way the resource is governed and managed. There are many reasons why water management fails, including lack of adequate water institutions, administrative capacity, lack of transparency, ambiguous jurisdictions, fragmented institutional structures, and lack of necessary infrastructure. Lack of infrastructure, such as roads and food storage, aggravated by poor regulatory and institutional governance, pose further problems. 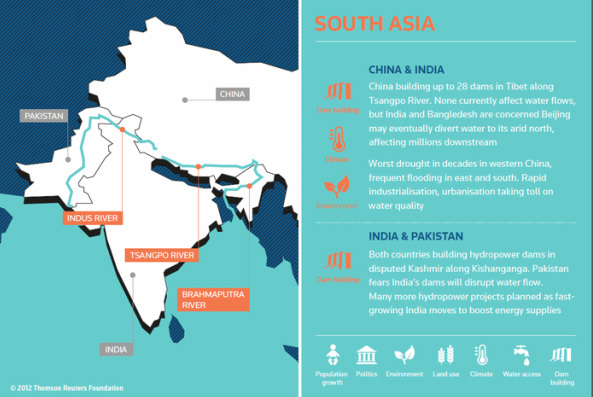 How can we encourage countries to cooperate and share water resources, which are expected to come under increasing pressure from floods and heat waves and from a population set to reach nine billion by 2050? Where are future conflicts likely to occur? 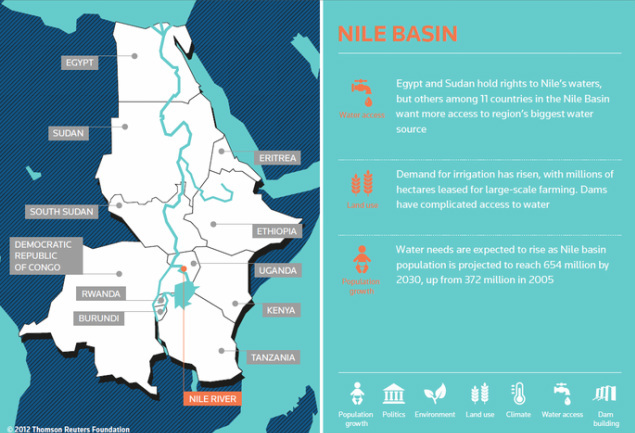 What can be done to encourage water cooperation?